Geographic Information Systems (GIS) are powerful computer-based tools used to enter, maintain, store, distribute, and analyze geospatial data. GIS and associated spatial analyses deal with the quantitative location of features and their associated attributes. GIS have been implemented across a broad range of research, science, business, and government applications. GIS are particularly effective for managing natural resources. As the development of oil and gas resources expands in the Intermountain West, so does the need for spatial data and spatial awareness of development impacts. GIS can be utilized to document and examine the potential and observed effects of oil and gas development on all impacted resources including: water, wildlife, cultural/historic, habitat, air quality, socioeconomic, vegetation etc. Furthermore, GIS provides a tool for oil and gas operators to effectively and efficiently manage development for the protection of resources and optimal production. Environmental Systems Research Institute: ESRI: What is GIS? Oil and Gas Statistics: Bureau of Land Management. Below are links to tables and spreadsheets with data that include the numbers of BLM-administered oil and gas leases, applications for permit to drill, and oil and gas wells. . Detailed Oil/Gas/Coalbed Methane Field Maps: United States Energy Information Administration. Basin-specific oil and gas field maps are included and show the locations, boundaries, names, and either the barrel-of-oil equivalent (BOE), the liquid hydrocarbon (crude oil plus lease condensate), or the natural gas reserve size for each field (2001 data). Additional maps include the 100 volumetrically largest oil and/or natural gas fields for proved resources and the status of coalbed methane in the United States. Maps are in PDF format. Oil and Gas Fields and Pipelines of Utah: Large map showing oil and gas fields, reservoir rock types, oil and gas pipelines, and operators. Map is in PDF format. Web site contains additional geologic maps. Use these links to explore interactive maps and create your own purpose-built maps. Interactive maps allow users to search and explore available data, which can then be dynamically mapped and exported. National Integrated Land System Geocommunicator: GeoCommunicator provides searching, accessing and dynamic mapping of BLM activities including Oil, Gas, and Geothermal Leasing, Coal and Other Solid Mineral Leasing, Right-of-way (ROW) Corridors, Stipulations (no surface occupancy etc. ), Mining Claims (unpatented), Land Use Permit, Land & Mineral Title, and many more. United States Energy Information Administration, U.S. States: Provides State profiles and energy estimates for the United States and U.S. territories. Provides current statistics for Economy, Prices, Reserves & Supply, Distribution & Marketing, Consumption, and Environment. The EIA mapping tool allows users to view the location of individual oil and gas wells across the country by checking "oil and gas wells" in the mapping system's "Layers/Legend" drop-down menu. USGS National Oil and Gas Assessment: Interactive map showing oil and gas basins of the US with links to full geologic reports and individual assessments for each basin with information on discovered and undiscovered oil and gas resources. Interactive map tool for making water resource decisions. Includes stream gauge data, water diversions, climate data (evaporation, precipitation, radiation), instream flow, hydrography, land use, groundwater levels, and groundwater wells. Utah Oil and Gas Well Locator: Interactive map tool for locating oil and gas wells in Utah. Shows oil and gas fields, wells, and associated data. Montana Board of Oil and Gas Conservation Webmapper: The WebMapper was developed to provide the citizens of Montana, the oil and gas industry, and other interested persons the ability to visually examine the spatial location of oil and gas producing wells throughout the state as related to roads, townships, rivers, and other cultural features. LOGIC (Land Office Geographic Information Center) provides a web map-viewer for general land status and oil/gas/minerals. The map viewer allows users to search and view by township, range, lease number, and well API number. SAGEMAP Interactive Map: Sagebrush And Grassland Ecosystem Map Assessment Project. SAGEMAP provides spatial data for the management of shrubsteppe and associated wildlife (sage grouse) in the western U.S. SAGEMAP is in the process of creating an improved interactive map, but the old one is still available for use. Areas of Historical Oil and Gas Exploration and Production in the United States, USGS: This report contains maps and associated spatial data showing historical oil and gas exploration and production in the United States. A hardcopy map was created to synthesize recorded exploration data from 1859 to 2005. In addition to the hardcopy map product, the data have been refined and made more accessible through the use of Geographic Information System (GIS) tools. GIS for Petroleum, ESRI: Provides information on how GIS is used in all stages of the oil and gas development process, including success stories. GIS Best Practices for Renewable Energy, ESRI (pdf): A 2010 ESRI paper discussing how GIS can help develop best practices for renewable energy. SKYTRUTH: SKYTRUTH is a non-profit organization specializing in aerial photography of environmentally impacted sites. Includes a variety of galleries of sites impacted by gas and oil development. Use these links to find, access, and download spatial data for use in a geographic information system. Most data are in shapefile format for use in GIS software, such as ArcGIS. Includes statewide oil and gas data as well as land use designations (data availability varies by state). Montana Geographic Information Clearinghouse: A comprehensive collection of geospatial data for Montana. Natural Diversity Information Source: Colorado Division of Wildlife. Includes shapefiles of statewide wildlife species activity, vegetation, hydrography, and administrative boundaries. New Mexico Resource Geographic Information System Program: A GIS data clearinghouse for New Mexico, including land use/ownership, geologic, and boundary data. 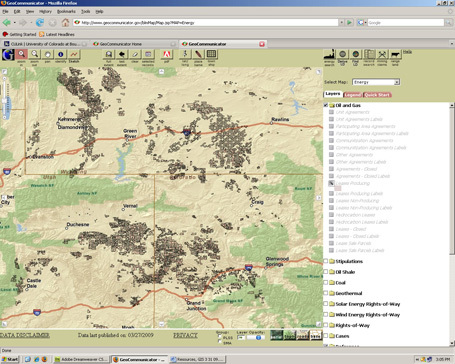 SAGEMAP, USGS: Includes thousands of data files related to shrubsteppe management and wildlife including sage grouse. Utah AGRC (Automated Geographic Reference Center): The State Geographic Information Database (SGID) contains files and links to many different categories of data sets including environment, geology, energy, wildlife, hydrology, land cover, and cultural. Utah Division of Wildlife Resources GIS Data: Available data include threatened, endangered, and sensitive species occurrences, bird and mammal habitat coverages, hunt boundaries, and management units. Data are in shapefile format. WyGISC Data Services: Provides several resources to access and download GIS and other geospatial data: the Wyoming GeoLibrary, central location for discovery of and access to geospatial data for Wyoming. Download imagery and Topos from the WyGISC Imagery Server. Clip and zip available through the WyGISC Data Server. Wyoming Landscape Conservation Initiative (WLCI) -Data Clearinghouse: Thiis data clearinghouse is an effort to catalog and provide access to all of the available data and information resources important to the WLCI: a long-term science based effort to assess and enhance aquatic and terrestrial habitats at a landscape scale in southwest Wyoming, while facilitating responsible development through local collaboration and partnerships. These free GIS applications allow users to view data layers and perform simple analysis. ArcGIS Explorer and Desktop, ESRI: A free GIS viewer that provides an easy way to explore, visualize, and share GIS information. ArcReader is a free, easy-to-use desktop mapping application that allows users to view, explore, and print maps and globes. Anyone with ArcReader can view high-quality interactive maps authored by a higher level ArcGIS Desktop product and published with the ArcGIS Publisher extension. ArcGIS is the preferred GIS software used by over 80% of all GIS professionals. GRASS is used for geospatial data management and analysis, image processing, graphics/maps production, spatial modeling, and visualization. Quantum GIS (QGIS) is a user-friendly open source GIS that runs on GNU/Linux, Unix, Mac OSX, and MS Windows. QGIS supports vector, raster, and database formats and is licensed under the GNU General Public License. A state-of-the-art GIS and remote sensing image processing system with an object-oriented data model which provides for the integration of raster and vector data representations in a single environment. SPRING is a product of Brazil's National Institute for Space Research.